After work today I am driving down to hang with my loves Jimmie and Anthony. To say I’m excited is an understatement. Whenever I’m about to visit, Jimmie calls and asks me “what i’m doing this weekend?” and I always make up something boring that I’m doing, “Just staying in I think, catching up on some reading.” It’s our thing. And it makes me ridiculously excited. A balance between sweet, salty, and chocolate are key here. I always have a cracker of some type, past faves include Wisecrackers, Wheat Thins, or Goldfish. 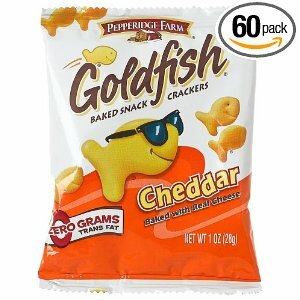 For this trip, I went with the goldfish, cause his sunnies? Totally LA. Next, we have your candy. I like a fruity option and a chocolate option. 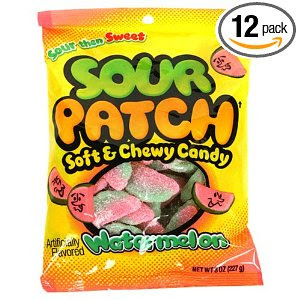 I always always always have chocolate covered raisins and this trip I also got some sour patch watermelon things. Just remember that while you’re driving, similar to when you’re in a movie theater, you don’t want to have to look at what you’re eating.. like Jelly Bellies. I love Jelly Bellies, but I don’t want to accidentally eat a buttered popcorn one while cruising down the 5, cause I will gag, swirve into the median, and die instantly. I got my water. A lot of it. Hydration is KEY. 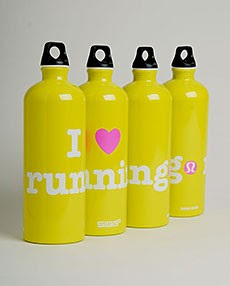 Sidenote: I bought this bottle with the full intention of finding a snarky sticker to cover up the running part, like “napping” or “puppies” or “muffins”… but now I actually like running. C’est la vie. 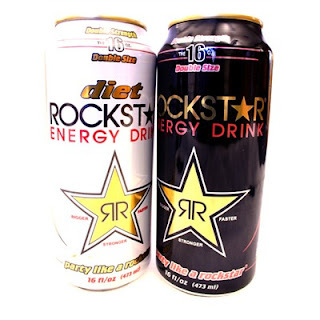 Next, we have you’re energy drink du jour. 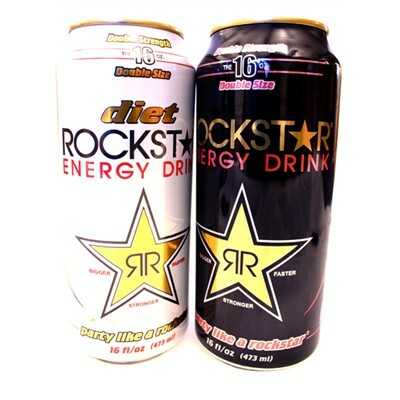 I know there are a lot of Red Bull fans out there, but I’m a Rockstar girl. I have been since college, I will die with one of these suckers in my hand. These are so important when you start getting sleepy! I just got my little AUX jack thing, so I will be rocking out to my iPod WHILE CHARGING IT. I have my free trial of my Sirius radio still, that’s going to be lovely. My friend Paul lent me some lectures on CD from The Teaching Company. 30-minute lectures on the lives of famous people. I’m kind of excited about this. When I was driving to and from Irvine a lot, I would always head by the local library for a book on tape cd. It’s free, and makes the hours in a car wizz by. Now it’s your turn. What are your tried-and-true Road Trip tips? I always have Junior Mints & Chex Mix,lots of water, tissues cause I always seem to sneeze while driving (as if that was safe!? )and loads of music. On my one-hour commutes to and fro from Irvine, I pick a problem – something that's been bothering me or weighing me down. I spend the entire hour thinking about it, calling my mom to talk through it, or doing a mental pro/con. My deal with myself is that once I arrive at my destination, it's over. Next Next post: Friday Inspiration.